Everett “Ebb” Haycock, emeritus member of the fine arts faculty, died June 11 in Delaware, Ohio. He was 94. He was born July 4, 1923, in Newark, N.J., to Ora (Hill) and Walter Haycock. 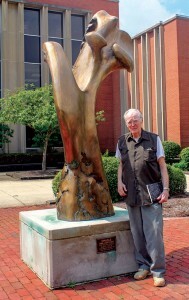 Haycock came to Ohio Wesleyan as a fine arts instructor in 1949, becoming full professor in 1968 and retiring in 1985. He was the driving force behind the creation of OWU’s foundry and cast metal program. The foundry is now located in Haycock Hall, a building named in his honor in 2002. Haycock graduated from Kutztown State Teachers College in Pennsylvania and received a master of art degree from Columbia University. He served in the Navy as a staff artist during World War II and taught at Lehigh University prior to OWU. His bronze sculpture Oracle near Beeghly Library is a campus landmark. Haycock was preceded in death by his wife of 73 years, Ernestine “Teena” Haycock, and is survived by their three children: Lorry Haycock Luikart ’73 and her husband Jack Luikart ’71, a member of the OWU Board of Trustees; as well as daughter Cindy Haycock Liscow ’76, and Jeffrey Haycock, and by grandchildren, great-grandchildren, and other family and friends. Memorial contributions may be made in his name to the Butler A. Jones House of Black Culture at owu.edu/give or by calling 740-368-3315.